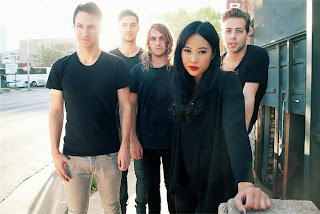 New Zealand alt rock band The Naked and Famous just released its sophomore album this week, called In Rolling Waves (Fiction Music). I took a quick listen, looking for another full on power pop experience similar to their song "Young Blood" off their 2010 debut, Passive Me, Aggressive You, which was a pick for my Fall 2010 Playlist. It didn't take long, as the second track did the trick. The song, "Hearts Like Ours," speaks of how "we're alone but side by side" with passionate melodies conveyed by singer Alisa Xayalith. She and Thom Powers started dating before they even started a band, so romantic notions of a life shared are an easy subject for their songs. The group moved to L.A. to write this follow up and recorded it in the iconic music enclave of Laurel Canyon. Check out the song in the official video below with obscure imagery of people floating in water, space and daydreams. Also, The Naked and Famous is setting off on an extensive tour later this month, with two dates in NYC at Terminal 5 October 10 and 11.